I’m currently halfway through 16 days off work for my birthday vacation. I don’t usually go anywhere, I just take time for me and to do things that I don’t normally have time to do…like deep clean my apartment. Seriously. This week has been non-stop clean, clean, clean! But I couldn’t be happier. My apartment is looking great and I’m feeling better about it as a whole. When I started this project last week, my apartment looked like a storage unit exploded in it. It’s not that I had too many things and nowhere to store them, although I won’t lie that was “part” of the problem. The majority of the problem is I have a horrible habit of never putting things back where they belong and they just accumulate on the sofas, the dining room table, on the backs of chairs, draped over my bicycle, piled up on the floor, the kitchen counters…it’s just crazy how unorganized I can be despite the fact that I LOVE to have things organized and neat and clean. So far, I have donated 2 trunks worth of clothes and other things I didn’t need anymore. I’ve thrown away about 4 bags of trash and broke down at least 10 boxes that I was holding onto for no good reason. I’ve also bought a shelving unit with the little cloth drawers to add a little more storage and I have plans to buy another one to go in the bathroom next week. I managed to get all 3 loads of clean laundry that had accumulated in my laundry room put away. All my dishes are currently washed. I’ve scrubbed the tub and the toilet. My apartment hasn’t been this clean since I moved in over 6.5 years ago. What did this week have for me exercise wise? Let’s take a look! • Saturday: no workout, just LOTS of walking around San Antonio with my awesome friend Jennifer. 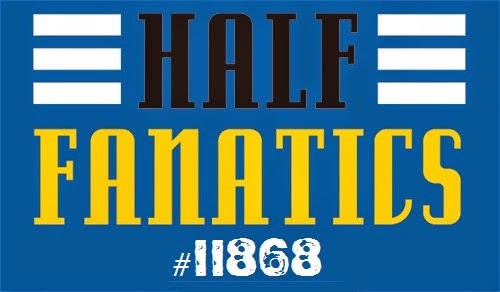 • Sunday: MARATHON DAY!!! I ran the Rock ‘n’ Roll San Antonio Marathon. 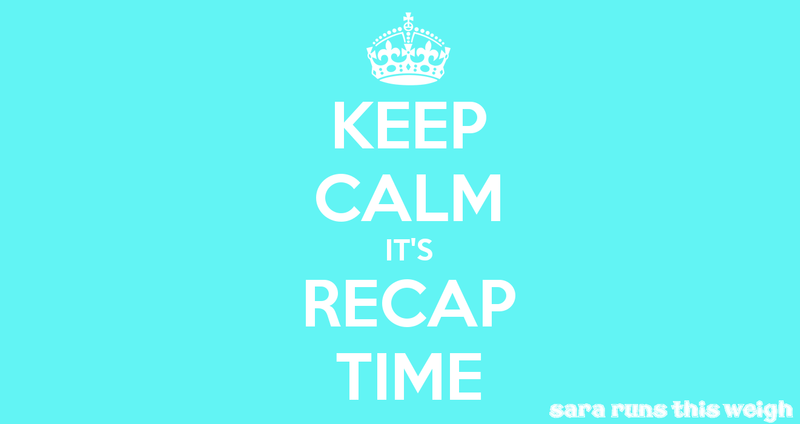 This was marathon #5 and it couldn’t have gone much better, really! Stay tuned for my race report that I will post as soon as I get my official photos in the mail (they've already shipped, so maybe by the end of this week!!!). 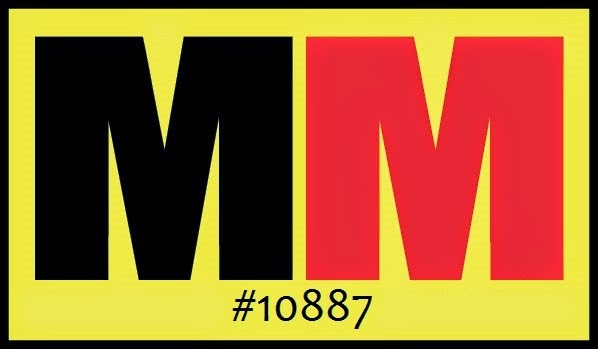 • Monday: the day after a marathon…nothing but squeaking in my 10K steps for the day. • Tuesday: still not feeling doing a workout and it’s the day after the day after a marathon and I’m still fairly sore, so no workout again. • Wednesday: I did a BUNCH of house work busy work this day, but I DID get to the gym for the first time since before Thanksgiving, if I remember correctly. It felt great! I did 5.75 miles on the elliptical in my standard 65 minutes. Then I did 40 minutes of strength training in the personal training area. 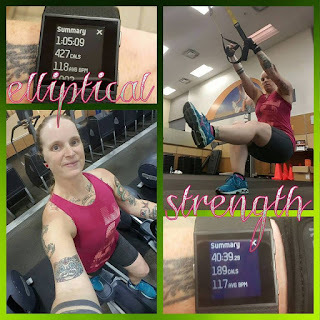 I did a few TRX exercises, BOSU squats, BOSU lunges, resistance band side steps, then front and side arm raises, and bicep curls. 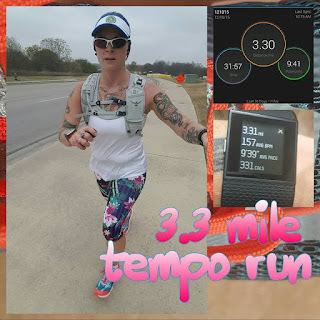 • Thursday: I went for a short run to stretch my legs and try out the new Altra zero drop running shoes I scored at the marathon expo. I had started itching to run Wednesday afternoon while running errands and seeing a few people out running. The shoes and me both performed phenomenally! I love the Altra shoes and want to get a second pair. 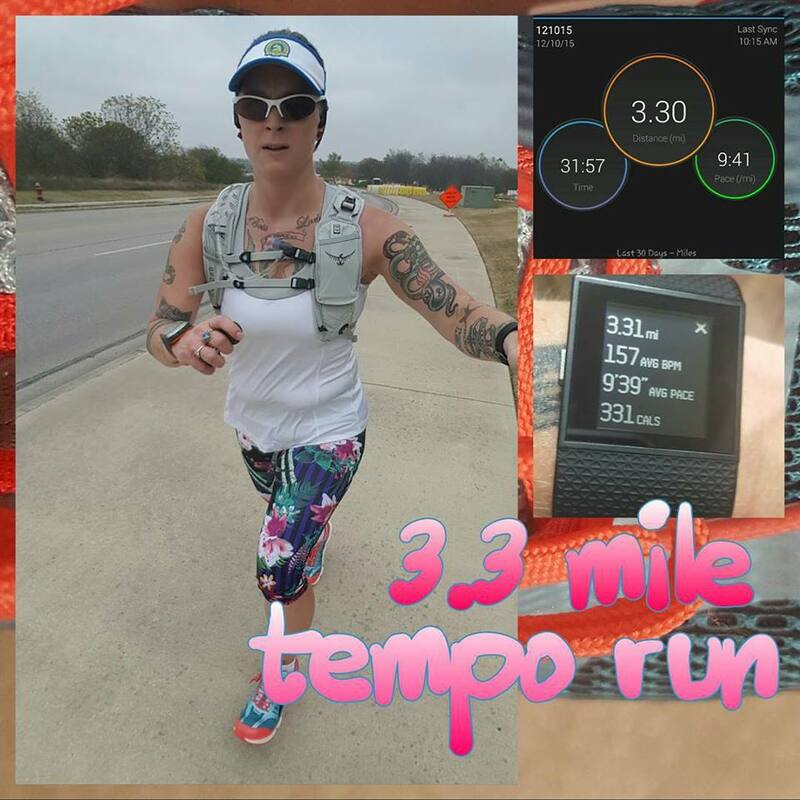 I knocked out my 3.3 mile run with a 9:40 overall average pace. Dang. I just felt really good, so I made it a short tempo run. Speaking of speed work, I found a plan that can help me shave that 14 minutes off my marathon time in the next 2 months! 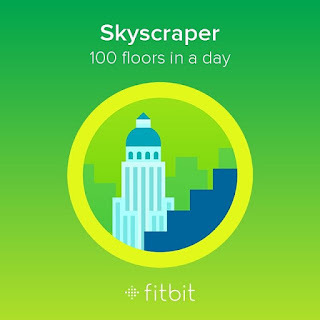 • Friday: did a 1.66 mile walk around my apartment complex and went up and down all the front facing flights of stairs, plus 36 more flights of stairs when I got back to my own building so that I could hit 100 floors climbed in one day on FitBit! I realized on Sunday that I forgot to take new progress pictures last Saturday for my first of the month progress check in. But, I figured since my measurements and weight hadn’t really changed since the first Saturday of November, that it wasn’t a big deal. I’ll remember for sure to take new ones the first Saturday of the new year, guaranteed!!! I got tattooed this week! I’ve been wanting this tattoo for over a year now, but the fire really got lit under me to get it when I crossed the finish line at the South Padre Island Marathon. 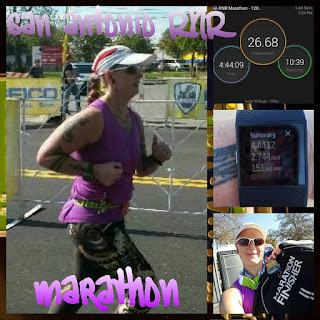 What I did by running a marathon when I wasn’t even close to being trained, let alone PROPERLY, trained was hard. It was a choice I made because it was the hard choice. I don’t do things because they’re easy. 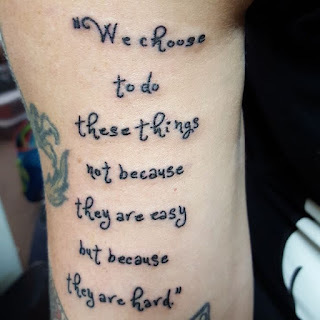 If they were easy everyone would do them! 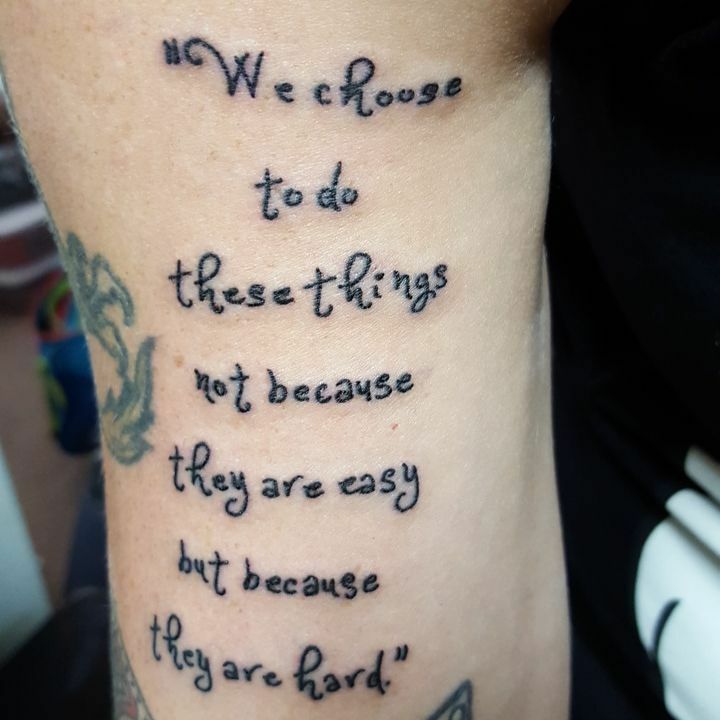 And now I have a reminder on my right bicep where I can easily see it telling me why I choose to do the things I choose to do. I had said that I had hopes of losing a pound or two while off for these 16 days. If I do, great, if I don’t, then hopefully I can just not gain anything. But, since it’s vacation, I’ve decided to not step on the scale until at least Friday. But, I might wait until next Saturday, the 26th before I step on the scale again. I’ve slipped the last few weeks and I need to refocus myself and my efforts. My binge eating urges and food anxiety issues are really strong right now. I’m hoping that they fade by the end of this week, preferably, I’m really hoping to be back on plan tomorrow or, at the latest, Tuesday. I want to be back to calorie counting and controlling and I want to be back to hitting the gym twice a week on top of running 3 times a week. I worked extremely hard and diligently to get down to 165 and I’m afraid that I’ve gone up a little bit since I weighed in last. I always seem to eat more the week following a marathon, at least with the last 2 I have. That’s another reason I’m laying off the scale for a week or two. I’m going to do what I can to lessen my urges and anxiety this week while steering myself back onto On-Plan Blvd.